This set of 10 1 oz silver bars includes two of each of the following designs minted by the SilverTowne Mint: SilverTowne Trademark 1oz bar, Buffalo Replica 1oz bar, SilverTowne Trademark Eagle 1oz bar, SilverTowne Mint Logo 1oz Bar, and the SilverTowne Prospector 1oz bar. 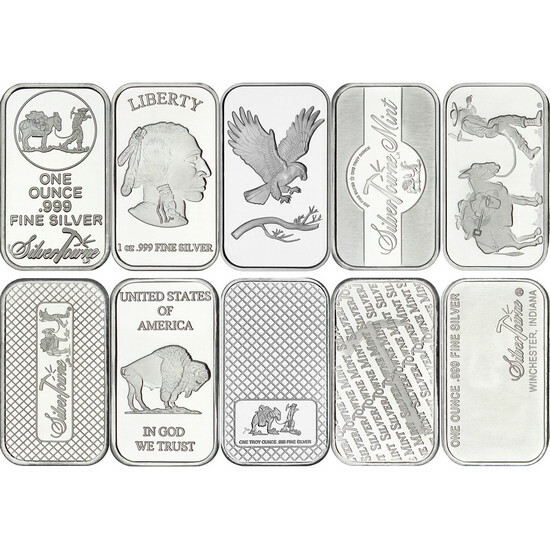 All of these designs are our standard bullion pieces and are guaranteed to be 1 Troy Ounce of .999 Fine Silver. 1 oz Silver bars are a great, affordable way to invest in silver through IRAs or just to add to your own personal silver stacks; the 1 Ounce size is easy to store and very portable. Each of these bars will arrive in heat-sealed plastic. The Mixed Designs 1oz .999 Silver Bar 10pc is a SilverTowne Mint Minted Bullion Product. Located in Winchester, Indiana, The SilverTowne Mint has been manufacturing quality Silver Bullion produced with the Highest Quality Standards since 1973. 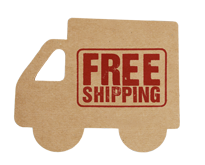 When purchasing the Mixed Designs 1oz .999 Silver Bar 10pc on SilverTowne.com you are buying direct from the source! The Mixed Designs 1oz .999 Silver Bar 10pc is a SilverTowne IRA Approved Product. Collecting physical silver, gold and other precious metals is a great way to diversify your holdings. For more information on adding precious metals to your portfolio visit SilverTowne.com/IRA or call 1-877-477-2646.